As with all these postcards I will spectacularly fail to do the city justice but hopefully provide enough reasons for you to want to visit. In the main I am going to concentrate on two areas; down town/ city centre and the West End. The main reason for this is that my visits are fleeting and I tend to just get to the main areas – this is not a bad thing and if you are there for a short break this is what you need to know. If you fly in, get the 500 bus just outside the terminal. For about £7 ish (return) this will take you to the city centre ending up at Buchanan Bus station. This is the part of town that sits under the loop of the M8 motorway and is where the main shops and a good selection of entertainment can be found. The famed Sauchiehall St runs across the north of this section and despite its fame its very disappointing – mostly low budget chain stores – however; it is the location of The Rennie Mackintosh Willow Tea Rooms. This is a daytime/ early evening place and serves variations on high tea/ light lunch, the rooms were restored in the 80’s and are to be found behind the ground floor jewellery shop entrance (217 Sauchiehall St). A much better option for shopping and browsing is Buchanan St – just around the corner – also pedestrianised and much more attractive. They still have a couple of Tardis’ on this street; at least one of which is a cappuccino stall. There are several good food options, especially early evening, but some places stop food service around 7.30pm and become bars. The Rogano Oyster Bar (on the side street linking Buchanan St with the Gallery of Modern Art) is a 30’s/ Deco treat and comprises several parts: Restaurant, Cafe, Terrace and The Chippy (roughly in descending price order). Around the corner (with lunch and early evening food) is The Social, actually; the Rogano /Social centre is a labyrinthine complex and includes lots of terraces for smokers. Bit more of a local: The Lab (down the alley at the side of Princess Sq Shopping centre), has good lunches. Cafe Andaluz – St Vincent Place – which of course is very Spanish, and does a set lunch of tapas, amongst more substantial fare. Urban (St Vincent Place), an ex bank building with a Gentleman’s club feel about it. Di Maggios (south side Princes Sq) Italian/ American deco style diner, with proper pizzas and a reasonable fish selection. Amarone (Nelson Mandela Place, just off Buchanan St) describes itself as a pizzeria; but it’s much more; the menu includes many typical Italian Bistro dishes and is worth a visit. Website is a bit fussy and not that much information that works… but the place is worth popping into if you are in the area. L’Ariosto (92 – 94 Mitchell St). Slightly more formal Italian Restaurant, excellent staff and specials for lunch and pre theatre dinners. The Dhabba (44 Candleriggs). Northern Indian, Michelin Listed 2010, friendly staff, good portions. Guy’s (24 Candleriggs). Scottish/ modern European, with locally sourced ingredients, very popular and you will almost certainly need to pre book (0141 552 1114). Gamba (225a West George St). Upmarket (mainly) fish restaurant and bar. Excellent, attentive (but not over the top) service, top end price wise, but good quality. (0141 572 0896). Cafe Gandolfi (64 Albion St). Scottish, separate fish restaurant a few doors away. Pulcinella (167 Hope St). Italian trattoria, good home cooked food including pizza, specials often available – especially at lunch. Can get busy. (Tel: 0141 572 0575). Opium (191 Hope St). Asian fusion; more a collection of Asian standards really, but quite good. (Tel: 0141 332 6668). I don’t usually list places unless I have been; but I’m listing these places as they have had fabulous reviews and I want it as a self reminder… The Wee Curry Shop. Bar Bloc is a live music bar on the corner of Wellington St and Bath St. If you need to eat in the area try the branch of Fratelli Sarti – upstairs. King Tut’s Wah Wah Hut – bar and live music venue. Stereo Bar – bar, restaurant (vegetarian/ vegan) and live music venue. I guess it had to happen eventually; being too tired to check out any recommendations, I wandered in to an Indian Restaurant called Asmaan on Bath St. All the clues were there: old photocopy of some ancient review in the window, tacky billboard outside, but I was lured in by the fact that they had Dosas listed on the menu. When I tried to order one I was told they were not on tonight and ‘anyway they were made from some sort of pastry’ !?!?! This was the final clue that should have told me to get out then and there… unfortunately for me; I ordered. This was not only the worst meal I have had in Glasgow, not only the worst ‘Indian’ meal I have had, but the worst meal I have had in years – it was like a 70’s joke Indian restaurant. Aloo Jeera was served in a sauce that I can well imagine appearing on neighbouring tables as Tikka Masala, it did have a few dried up old cumin seeds thrown in – but to no effect. Note to the chef: chucking an inch square piece of yellow pepper in to a sauce does not a Jalfrezi make… Avoid… at all costs. East of Buchanan St and south of the council house/ George Sq is the area known as Merchant City – an area steeped in the City’s trading history, now benefiting from much restoration and home to lots of bars and restaurants. Many of the properties in this area were private homes – in fact even the Glasgow Museum of Modern Art – was a private home and built on the proceeds of tobacco. Huge selection of bars, restaurants and shops; a good place to wander and it really comes alive at night. Recommended street in Merchant City: Candleriggs. Between Buchanan St and the start of Merchant City is another large bar/ restaurant complex called the Corinthian, the food here is very good and was highly rated in a Guardian survey. The whole complex was originally a bank. A mix of student, upmarket and a bit off the wall, the West End is well worth a visit. There are some very attractive streets in the West End along with delis second hand clothing shops and a good selection of restaurants, a good selection of these being in Ashton Lane; turn left out of Hillhead subway station and left again after 10 yards. Loads of ‘fashion bars’ many with gardens plus restaurants and a cinema. 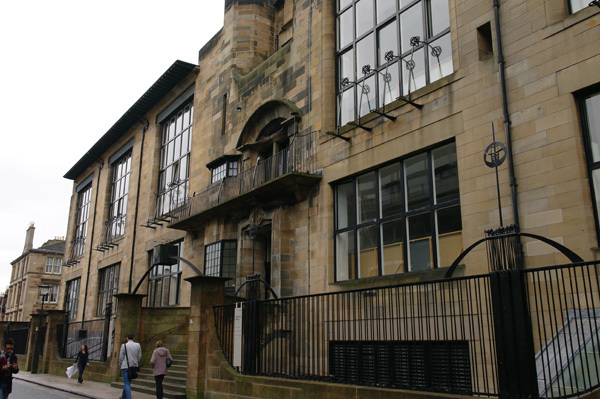 The Hunterian Art Gallery, which includes the interior of 6 Florentine Terrace, otherwise known as the home of Charles and Margaret Rennie Mackintosh from 1906 – 14. Kelvingrove Art Galley – vast collection and all recently refurbished. Full details of all Glasgow museums and art galleries here. Glasgow is a great place for a weekend stay, the weather can be a little unpredictable but the people are friendly and the atmosphere good – give it a go; you can get there and back for forty quid.